1 of 1 Chop 12 small chocolate-covered pretzels (1/2 cup chopped). Fold into batter. To frost: Melt 3 oz coarsely chopped semisweet chocolate in microwave for 11/2 minutes. Stir until smooth. Cool slightly. Beat 1/2 cup (1 stick) softened unsalted butter with 2 cups confectioners sugar and 2 tbsp milk. Beat in 1 heaping tbsp of the melted chocolate. Transfer remaining chocolate to a resealable plastic bag. 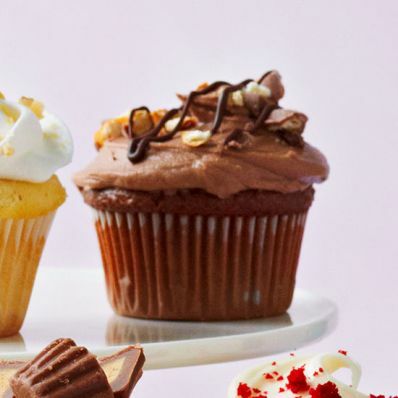 Spread frosting over cupcakes. Snip a small corner from bag and drizzle chocolate over cupcakes (reheat if needed). Top with 1/2 cup chopped chocolate-covered pretzels.